I am not fine. I am not okay. How are you? Boyfriend is fine. Business is fine. Life is just fine. Similarly, I am not okay with okay. Family is okay. Apartment is okay. Work is going okay. Okay drains my life force and Fine makes my soul wither. Fine and Okay imply a standard of steadiness that is viewed as culturally aspirational, but experienced, by me, as more life-sucking than life-sustaining or life-enhancing. I acknowledge and deeply respect that there are people who love an even keel and calm waters, but I am not one of them. That saying, a ship is safe in harbor but that’s not what ships are built for? That’s me. I am that ship (I’ve got a hunch you are too), and it gets rocky out here. There is a deep prejudice in the consciousness of humanity that favors still perfection, and denies the mess, the creativity, the tumult, and the timeline of process. If you are someone who is afraid of writing her book because you feel your voice doesn’t have enough value, or you are scared of starting your own business because you might fail or do it all wrong, or you resist changing jobs or partners because you might not do better than what you’ve got, then the deep prejudice of perfection in our culture is owning you. There is a part of each of us that is bigger than this. Our love, our longings, our desires, our creativity. All of them, they are messy. They are imperfect. They’re not particularly Instagram-able. Place your hand on your heart right now. Feel that pulse. That beating. The pumping of your blood, your life force, your unique divine rhythm. We are miraculous and unexplainable. And sometimes we forget to feel into that truth. Because we are striving for some kind of aspirational perfection that comes from a culture that has lost its poetry. Because we are forgetting how beautiful the mess is. Because, otherwise, we’re just … okay. Fine. I love to feel the deep, churning creation and recreation of life. In all her glory. The way she expands, then contracts. Blooms, dies, rots, buds again. And while that is the absolute essential truth of my truth, figuring out how to navigate when the waves of Life aren’t just choppy but I’m in the middle of a tsunami and the night is dark and the stars are hidden and I don’t know the way and I’m wishing for calmer daybreak … it’s hard. It’s disorienting. I remind myself: Life knows things we don’t know. Life wants things for us we have not even dreamed of. In the last month, I’ve been in rough waters in a few areas of life with just a sliver of a waxing moon to see by. The waves are high. The deck furniture is scattered. The debris is all about. I have cried my own ocean and howled with the storm and I have felt my racing pulse and told myself: this is what I’m built for. And, sisters, I am so much better than fine. Wherever you are in the waters, I know this: so are you. The School of Womanly Arts Mastery Program — Regena’s signature, internationally-renowned work — was created over 20 years ago, to be a road map for women to get unstuck, turned on, and thriving inside a deeply supportive community. 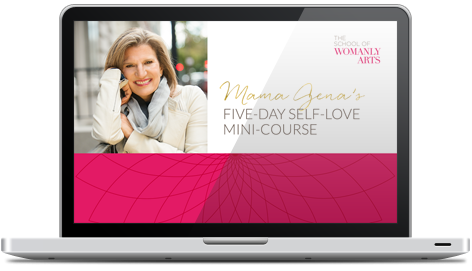 It is an immersive, experiential course unlike anything else in the world, with a combination of live intensives in New York City with Regena — Mama Gena herself — and ongoing support structures in-between. Women come from around the globe to join the movement and change their lives. Are you thinking of joining them? If you’re inspired, or intrigued, or this awakens something inside you – you can book an exploratory call with our team (Lilly and Stacy are ready for you) to ask questions and see if 2019 feels like your year for Mastery.